With BMW you always have the safest drive. Equipped with intelligent safety features which are designed to minimize the risk of accidents, you always know you’re safe in your BMW. The whole complex is built by all components which are forming the robust body of the car and which are working together to provide the best protection in case of a collision of any kind. BMW active safety is what prevents accidents before they happen: it is the key to safe driving. The BMW intelligent road safety systems offer a better view and automatically, more peace of mind. However, if a hazardous situation occurs, a thorough system of suspension, engine management and brakes helps the driver to confidently overcome the situation through precise control. In case of a tire explosion, special side reinforcements in the optional run-flat tires allow you to continue your trip up to 250 kilometers. The aim of passive safety is to ensure that all passengers and pedestrians are given a maximum protection. Implementing safety is always first, starting with the fundamental constructions of innovative steel. Special materials are used and intelligently combined to provide superior protection for all passengers. They also deform in order to absorb the energy impact and to deviate it from all passengers and other parties involved in the collision. The latest-generation airbags provide further protection for passengers. Comfort and safety for your child! Legislation shows that babies and children should be transported in special car seats for children, appropriate to their age, their height and weight. The BMW child seats we have are equipped with ergonomic systems and are available in different colors and patterns suitable for every child, and can be used as special seats for the car due to their special design to provide relaxation and better sleep for children. 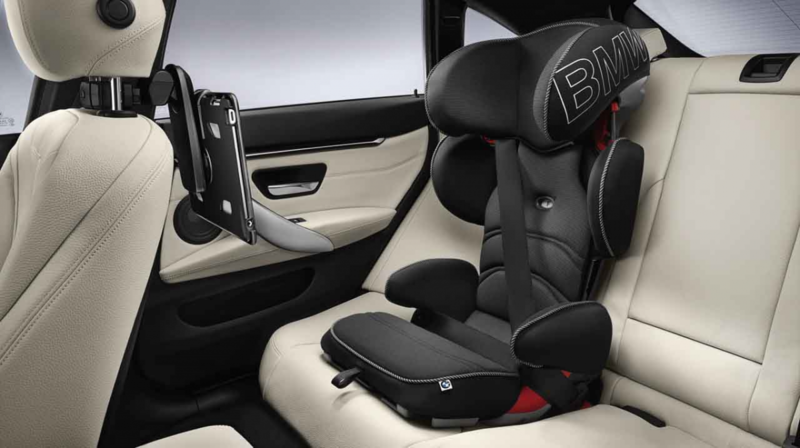 Do not accept any compromises: child seats BMW Junior I-II will ensure complete safety and comfort for your child!